Chris Fabry is an award-winning author and radio personality who hosts the daily program Chris Fabry Live on Moody Radio. He is also heard on Love Worth Finding, Building Relationships with Dr. Gary Chapman, and other radio programs. A 1982 graduate of the W. Page Pitt School of Journalism at Marshall University and a native of West Virginia, Chris and his wife, Andrea, now live in Arizona and are the parents of nine children. Chris' novels, which include Dogwood, June Bug, Almost Heaven, Not in the Heart, Borders of the Heart, Every Waking Moment, The Promise of Jesse Woods, Looking into You, and his latest release, Under a Cloudless Sky, have won five Christy Awards, an ECPA Christian Book Award, and two Christianity Today Book Awards of Merit, but it's his lyrical prose and tales of redemption that keep readers returning for more. Chris has also published more than 70 other books, ranging from nonfiction and film novelizations, including the recent bestseller War Room, to novels for children and young adults. He coauthored the Left Behind: The Kids series with Jerry B. Jenkins and Tim LaHaye, as well as the Red Rock Mysteries and The Wormling series with Jerry B. Jenkins. RPM is his latest series for kids and explores the exciting world of NASCAR.  As a child, Chris Fabry wrote stories, songs, and poems. The creative process invigorated him. He may not have been a fast reader, but the words on the page had a deep effect. So he vowed that if he ever had the chance to write, he would take it. After high school, Chris attended and graduated from the W. Page Pitt School of Journalism at Marshall University in Huntington, West Virginia. After graduation, Chris and his wife felt a desire for biblical education, so his pastor suggested they check out Moody Bible Institute in Chicago. At Moody, Chris met Jerry Jenkins, who learned of his desire to write and encouraged him to pursue his dream. In 1998, Jenkins and Dr. Tim LaHaye hired him to write the Left Behind: The Kids series. He wrote 35 books in that series over the next six years. 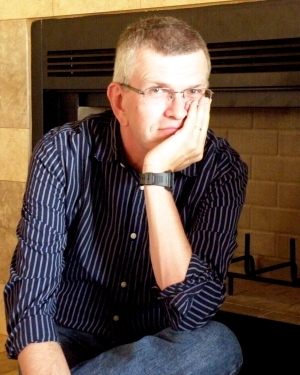 He later collaborated with Jenkins on the Red Rock Mysteries series and The Wormling series, and in 2008 he worked solo on the NASCAR-based RPM series. Since then he has published nine novels for adults: Dogwood, June Bug, Almost Heaven, Not in the Heart, Borders of the Heart, Every Waking Moment, The Promise of Jesse Woods, Looking into You, and his latest release, Under a Cloudless Sky. His first six novels were nominated for Christy Awards in the Contemporary Standalone category, winning in 2009 for Dogwood and in 2011 for Almost Heaven, which was also awarded that year's Christian Book Award for Fiction, and in 2013 for Not in the Heart. Every Waking Moment received the 2014 Christianity Today Book Award of Merit in the Fiction category, with The Promise of Jesse Woods receiving the same award in 2017. The Promise of Jesse Woods was also awarded the 2017 Christy Award for General Fiction, with Looking into You receiving that year's Christy in the Short Form category. In 2018, Chris was inducted into the Christy Award Hall of Fame as a five-time award recipient. The past few years have also found Chris embarking on a new journey in fiction-writing: the novelization of film screenplays. The motion picture The Song released in September 2014, with the novel developed from Richard L. Ramsey's screenplay following later that year. Chris also created the novelization of War Room, the widely acclaimed film produced by the Kendrick brothers (Courageous, Fireproof). Both film and novel were released in August 2015. Chris is currently hard at work on the novelization of another Kendrick brothers film titled Overcomer, scheduled for release in July 2019. In addition to his fiction work, Chris also collaborated on two bestselling football biographies with Ohio State's Jim Tressel and Drew Brees of the New Orleans Saints. In 2011 he collaborated with renowned marriage expert Dr. Gary Chapman on A Marriage Carol, a Christmas novella offering hope for struggling marriages. Chris and Dr. Chapman renewed their writing partnership in 2013 with a book on the dysfunctional family tree of Jesus, titled Extraordinary Grace. Altogether, Chris has published 80 books for children and adults. Chris Fabry's other passion is broadcasting. As part of the DECCA program in high school, he worked at WNST Radio in Milton, WV. During his senior year at Marshall University he worked for WSAZ-TV as a weekend reporter. In 1985 he began hosting Open Line, a national call-in show which he hosted until 1997. In 1993 he began a six-year stint as co-host of Mornings with Greg and Chris on WMBI in Chicago. Then in May of 2008 he began Chris Fabry Live, which received the 2008 Talk Personality of the Year Award from the National Religious Broadcasters. He can also be heard daily on Love Worth Finding, featuring the teaching of the late Dr. Adrian Rogers, and weekly on Building Relationships with Dr. Gary Chapman, which he co-hosts with his wife, Andrea. Chris and Andrea were married in 1982 and are the parents of nine children. In October of 2008, after a lengthy time of illness for their family, the Fabrys vacated their home in Colorado due to a toxic mold problem. They left everything behind, moving to Tucson, Arizona, in early 2009 to seek medical help. Their family's health has improved, for which they are grateful. According to Chris, "My family is what energizes me. Most of all, I want to succeed as a husband and father."